Sunday was a strange day, weather wise, in Chicago. While the day prior was relatively mild for late January, Sunday started out meek but ended with a roar as a fierce torrent of freezing rain and thundersnow quickly descended. It was cold, wet, icy and altogether unpleasant and this mess started at the exact moment the first batch of friends arrived for Sunday Lunch. If there was ever a time to serve warm, filling comfort food, this was it. Cassoulet Sunday had met its match. I look forward to Sunday Lunches all month not only because it gives me a chance to cook, really cook, but also because I immensely enjoy the company of my friends. We catch up on the happenings of the last few weeks, discuss with equal passion both deep, meaningful topics and the completely ridiculous, complain about our workloads and laugh deep hysterical belly laughs. You know that feeling when you laugh so hard you’re sore the next day? That. They’re good people and they eat with abandon. I appreciate that. Sunday I broke out all the tricks and treats from my summer escape to Southwest France and other recent adventures … there was the charcuterie I stashed in the depths of my freezer from that trip as well as bits from Grrls Meat Camp, including a lovely Noix de Jambon I made myself (with a lot of help). A delicious chicken liver pâté with port gelée from David Lebovitz (a slight variation from the one in Michael Ruhlman’s e-book, Schmaltz) was throughly enjoyed. Warming cups of glögg were standing by, steeped in the spices purchased in Stockholm. Fact: an icy wet day benefits greatly from some boozy spiced wine. The meal started with a salad, combining a tart sherry vinaigrette, candied walnuts and confit de geisers from a fantastic farmer in Gascony. The combination was bright and rich at the same time; utterly delicious. 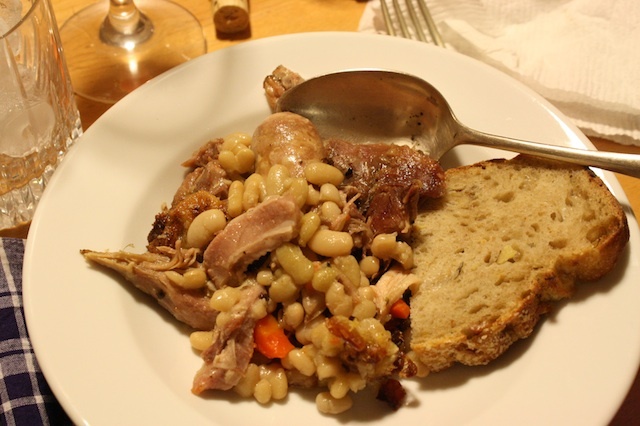 The crowning glory came next, a bubbling cassoulet studded with pork belly, Saucisson de Toulouse, and duck confit from that same Gascon farmer, swimming in these beans. I’ve developed a deep affinity for this dish, prodded along by my friend Kate Hill the one responsible for my love of Gascony and the Cassoulet Queen if there ever was one. I followed her recipe here, for the most part, and took care to let the beans form a nice dark crust from a long slow bake in a moderate oven. One night over dinner this summer, a lively debate broke out between Kate and Michael Ruhlman over the place a breadcrumb crust in cassoulet. Even now, I hear her voice, quietly warning me, “Absolutely no breadcrumbs!” and I dutifully obeyed. Fact is that bean crust, properly formed, is damn tasty. No breadcrumbs needed. 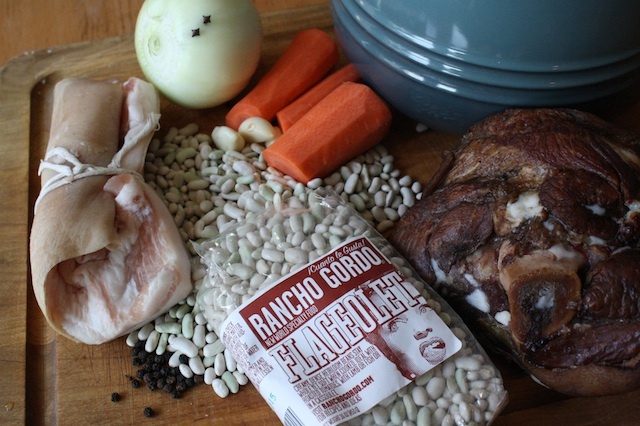 I ordered the flageolet beans from Rancho Gordo but any sturdy white bean will do. If you live in Chicago, Rob at The Butcher & Larder routinely carries Saucisson de Toulouse though it’s generally not an easy find, certainly not at your local grocery store chain. In that case, a mild pork sausage will make a fine substitution. If you’re ambitious, make your own – it’s just good ground pork, salt, pepper and a smidge of nutmeg. 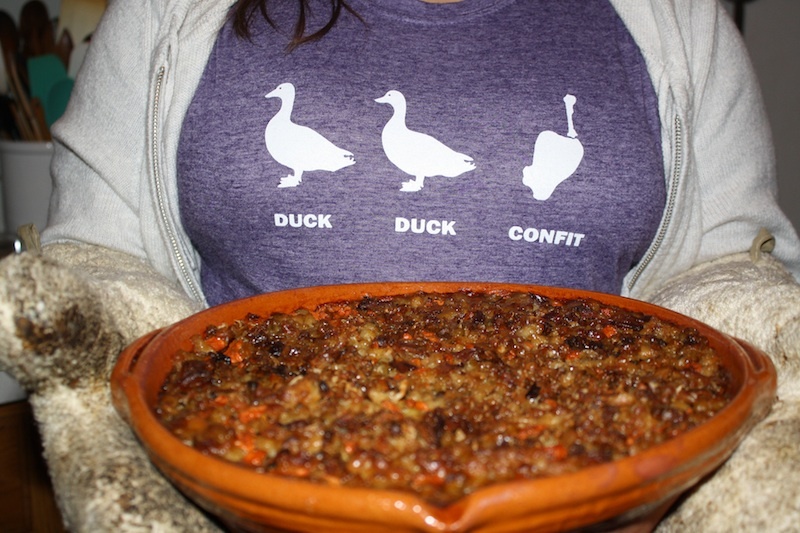 The point is we can all make cassoulet; exactly how is up to you. 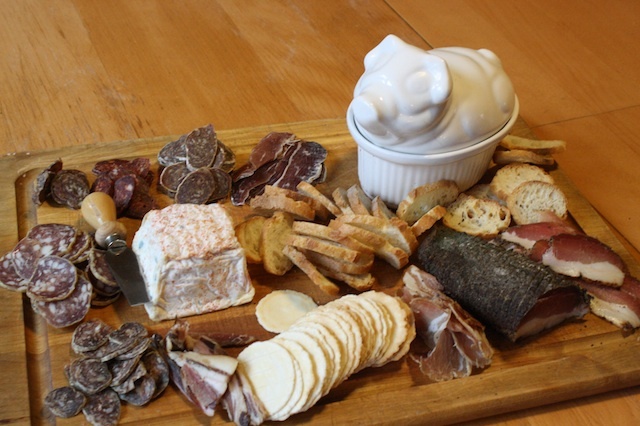 This is the key in understanding regional cooking – use what’s abundant and readily available. 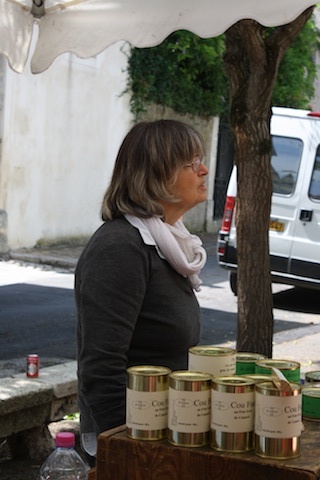 If you want to learn first hand about cassoulet in Gascony, go see my friend Kate and take one of her Camp Cassoulet workshops. I cannot recommend it highly enough. She’s also working on an Cassoulet iPad App releasing anytime now – watch here for updates. Dessert was fitting of the theme, a Gâteau Basque, buttery cookie-like layers filled with sour cherry jam and pastry cream because that’s how I like it. It seemed a little lonely on the plate so I made blackberry sorbet for contrast then realized I had a pint in the freezer already. Whoops. 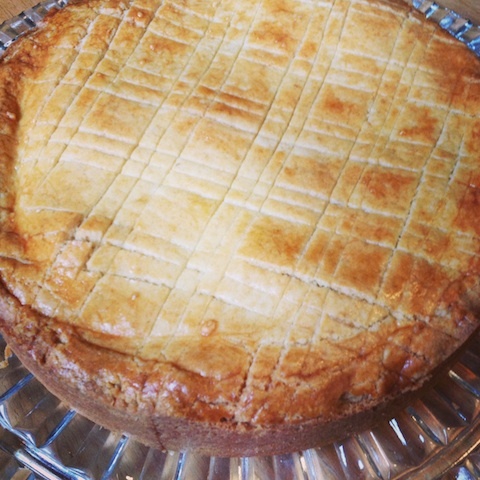 I used this recipe for the gateau and it was good (her recipes are always good) but I had an ideal in my mind and this didn’t quite match. Kate and I stopped in Espelette this summer, a town in the French Basque region that is known for two things – piment d’espelette and gâteau basque. That version is now my gold standard. I’ll figure it out one of these days. My crowd has also grown quite fond of the digestif, a little after dinner drink said to aid the digestion. We like to linger. Since I returned from France, the slow warming burn of a nice Armagnac has a definite appeal but port, particularly the white variety, has been a frequent guest. I usually make a few little sweet nibbles to accompany these drinks, a trick I picked up while working in the fine dining world. It’s a delightful thing to linger over a nice armagnac with a little cookie or two. 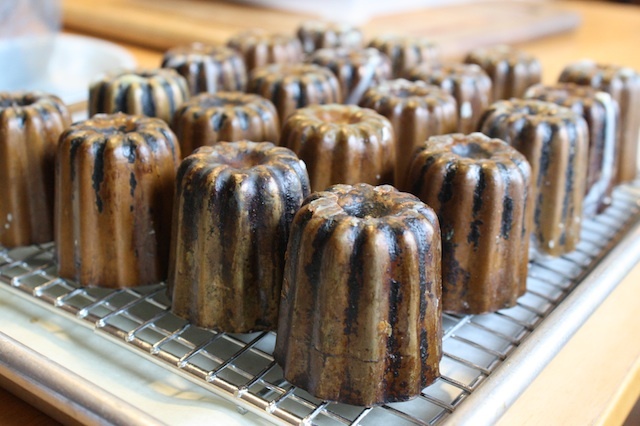 And any excuse I have to make the Bordeaux specialty, cannelé, I’ll take. 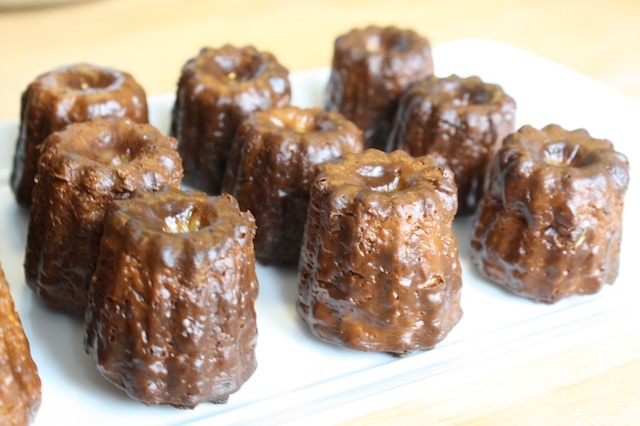 A cross between a caramelized cake and a vanilla rich custard, they are fantastic and there were many converts to the cannelé way Sunday night. Somehow, after a large and very filling dinner, 7 of us managed to find room to polish off 2 dozen of these things. Doesn’t surprise me in the least. They’re addictive. No recipes this time but there are plenty of links above to get you started should you choose to do so. STRESS BAKING THERAPY FACTOR: ACES. Admittedly, there is a certain amount of anxiety involved with having people over for dinner. Is the house clean? Will they notice the pile of dirty laundry shoved under my bed? Did I buy the right wine? Will all the dishes be done in time, at the same time? Here’s a bit of advice: push all that self doubt aside. Give it a good strong heave-ho shove. If you invite the good people in your life and stick to who you are, everything will be fine. Regardless of how clean your apartment is or how the food turns out, it won’t really matter. Take comfort that everyone has cooked a dud at some point. It’s a fact. The guest list should be filled with people who are just as fun to talk to as they are supportive eaters. While my home will never be perfectly arranged or featured in House Beautiful, I’m OK with that. What I can do is throw together a really good time. And I always – always – have enough booze.